No one is in charge in Australia. Monday’s leadership challenge by Home Affairs minister, the potato-headed former police officer Peter Dutton, was cutting enough to leave Prime Minister Malcolm Turnbull a wounded animal. 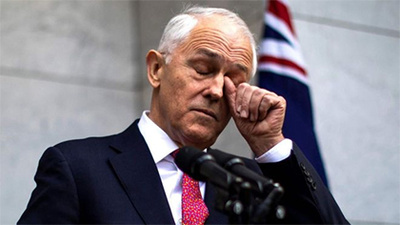 The 48 to 35 margin of victory demonstrated the sheer degree of disaffection for the leadership within party ranks, and risks keeping that unenviable record of no Australian prime minister lasting out a full term of office since John Howard’s 2004 election victory. Ever blinkered and reactionary, his policy offerings continue to be unimaginative, the stuff of cold porridge. To cope with housing affordability, immigration needs to looked at. To deal with infrastructure problems, immigration needs to be looked at. “I think you need to cut the numbers back.” This is less the remit of a potential prime minister as a demagogue who remains trapped in the portfolio of home affairs. It has been a true spectacle of self-destructive delight: the Liberals immolating themselves in plain sight, while justifying such behaviour on the broader premise of “debate” and calm thinking. Foreign Minister Julie Bishop claimed on Tuesday morning that there were conservatives, moderates and those somewhere in the middle. Other front benchers suggested that this was the Liberal method, which was simply another way of concealing a tribalism more commonly associated with the opposition Labor Party. The broader reality is that centre-right politics in Australia has become cacophonous. The Turnbull ship, as it heads to a monumental iceberg, was given a further push with the defeat of the company tax cut policy in the Senate. It had been, since 2016, a vital aspect of the prime minister’s trickle-down economics, another enduring fiction that has ceased to catch the imagination of many in the electorate. Selling a policy reducing the tax rate from 30 to 25 percent for companies earning over $50 million, thereby shrinking a vital tax base, has not gone well for the former merchant banker, whose connection with the Australian voter continues to look curiously alien. Little wonder, then, that the tribe is unruly, leaving the extremists to go on the rampage. Things also look murky for the main challenger. In what must be yet another example of history’s distinct lack of cunning, the man who was so enthusiastic about keeping refugee children in offshore detention has a family trust operating a childcare company in receipt of Commonwealth funding. The amount is not negligible: some $5.6 million dispensed to both the Camelia Avenue Childcare Centre and another centre located in Bald Hill. The significance of this is that section 44 of the Constitution might well render Dutton ineligible to sit in parliament as it rules out those with “any direct or indirect pecuniary interest in any agreement with the Public Service of the Commonwealth”. Most troubling in the Dutton challenge is its acceptable extremism. His language is the unreformed, unconstructed argot of law, order and directed hysteria. He is an instinctive authoritarian who is unlikely to govern by consensus. The method, rather, will be through imposition and dictation. Australians and those coming to the country can expect an aggressive push in the direction of the police state. But Turnbull’s ultimate failing has been a pronounced and seemingly growing inability to lead a party keen to lurch with ever greater urgency to the right.